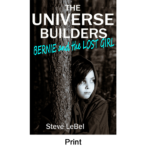 In Bernie and the Lost Girl, there is a scene where the children run into a group of giant apes who howl at them. This is the photo that inspired that scene. They’re called Howler Monkeys and are native to South and Central America. They’re widely considered to be the loudest land animal. Their howling ability is very real, and, according to Guinness Book of World Records, they can be heard as far as three miles away through dense rainforest. The function of howling is thought to relate to intergroup spacing and territory protection, as well as possibly to mate-guarding. This entry was posted in Writing Inspirations. Bookmark the permalink.